I love making pizzas with my family. I say pizza with an “S” because I end up making individual pizzas for each of us… I halve, double, or make regular portions of my version of a Weight Watchers whole wheat pizza dough recipe and go from there, depending on who’s having dinner with us that evening. 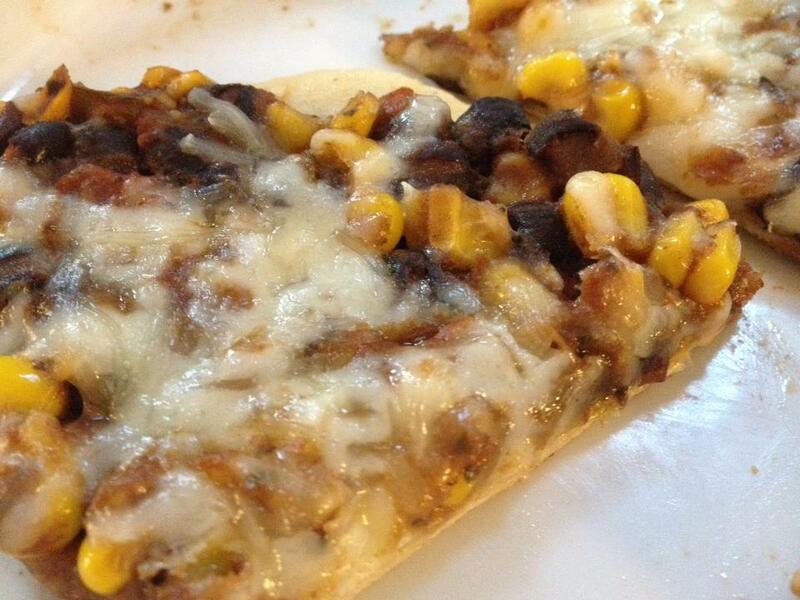 For M, it’s ham and pepperoni… for D, it’s a cheese pizza… if we’re including E for dinner, it’s just pepperoni… but for me, it’s a special black bean and corn salsa pizza. Doesn’t this look delicious? 1. To prepare sponge, in a large bowl, sprinkle yeast over the water; when the yeast looks wet, add flour and stir hard. Cover loosely with plastic wrap or a damp towel and let stand at room temperature for about 40 minutes. 2. To make the dough, stir the milk into the sponge. In a medium bowl, combine the all-purpose flour, whole-wheat flour, salt and equal. Add to the sponge and stir to blend. 3. Lightly sprinkle work surface with flour. Turn out the dough; knead until it become elastic and resilient, 10-12 minutes. *This is important… dough needs to be kneaded thoroughly for this to work. 4. Spray a large bowl with Pam, place dough in bowl and cover loosely with plastic wrap or damp towel and let rise in a warm, draft-free place until doubled in volume, 45-60 minutes. 5. Preheat oven to 450 degrees. Punch down dough, lightly sprinkle the work surface with flour and roll out dough to a 14” circle. 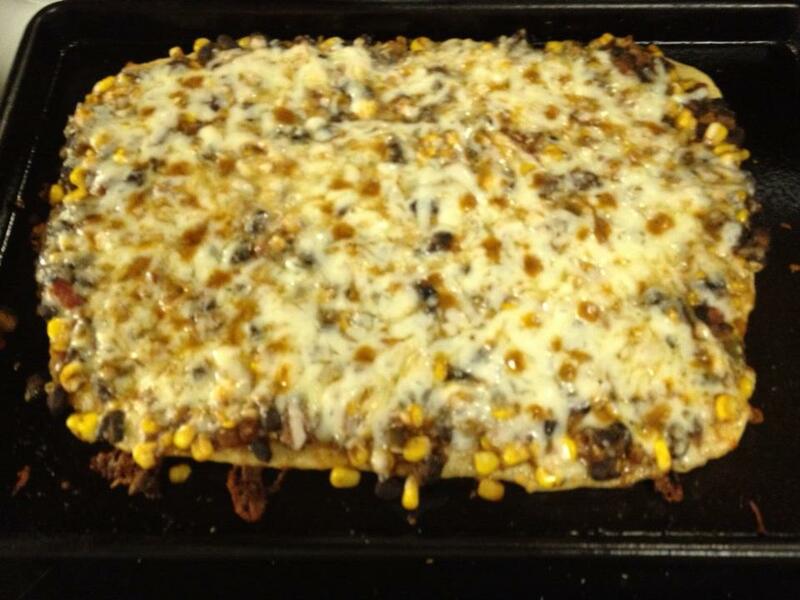 Transfer dough to a baking sheet, arrange toppings and bake until lightly browned, about 10 minutes. Once the dough is done, I form each person’s pizza. For mine, I roll it into a rectangle (as noted above) and then spray with Pam and sprinkle garlic powder on top. I’m now ready to mix up my version of black bean and corn salsa. Using The Force, I mix a can of drained/rinsed black beans, an equal amount of fresh corn off the cob (or a can, drained and rinsed), mild salsa, some taco seasonings and some Cabernet Sauvignon. I like to also add a spoonful of pesto to add some depth to the taste and use about 1 cup of this mixture to top my pizza. The pesto recipe that I like best is one that my niece created and posted on her blog, PB Fingers and called Sunflower Seed and Walnut Pesto (http://www.pbfingers.com/2012/06/26/sunflower-seed-and-walnut-pesto/). If you want to read her blog, Peanut Butter Fingers, use this link and follow her for some terrific new recipes and great fitness ideas (http://www.pbfingers.com/). I would read this blog every day even if she wasn’t my niece! After topping the pizza with your salsa, add your favorite cheese blend and follow the cooking directions as noted above. I used a blend of Asiago and Parmesan cheeses in the pizza I made the other night. Here’s how yummy it looked when I pulled it out of the oven. I like to cut my pizza into 8 pieces and eat it with a knife and fork. There’s so much on top of this pizza crust that it’s just impossible to pick up and eat any other way. I hope you’ll try this pizza dough recipe sometime and play around with different toppings on your own pizza. There are franchises out there that make big money creating bizarre blends for pizzas… take a chance and create something that’s totally yours. You might be stunned at how well it all turns out! This entry was posted in Recipe, Wine and tagged black beans, Cabernet Sauvignon, cheese, corn, homemade pizza, pbfingers.com, pesto, pizza, salsa, sunflower seed and walnut pesto, weight watchers, whole wheat pizza dough.